When people think of the Portland Food Cart Scene they may think of the rows of food carts downtown Portland. Nestled in those are some pretty great treasures, but there is more than just the downtown carts. Across the river there are pods of food carts that offer covered and heated seating. Some of them even serve your meals on real plates and give you real silverware. Yes, it’s true. If you are lucky enough to find the right pod you can even order a beer. I’m a sucker for pasta. Good pasta that is. At Gabagool they make the pasta right in their cart. The toppings are very seasonal, which I love. I had a fall pasta dish with delicata squash, roasted tomatoes and a fried egg on top. He also had a root vegetable ravioli that sounded amazing. Plus he makes these wraps out of breads that are so thin they look like tortillas. The pasta coming out of here is restaurant quality pasta or maybe even better in some cases. I plan to go back again to see other creative pasta dishes and ravioli fillings he comes up with. This is another place that we couldn’t stop talking about. They use real dishes, which makes you feel like you are no longer eating at a food cart, but instead you are sitting outside on a patio of an upscale restaurant. 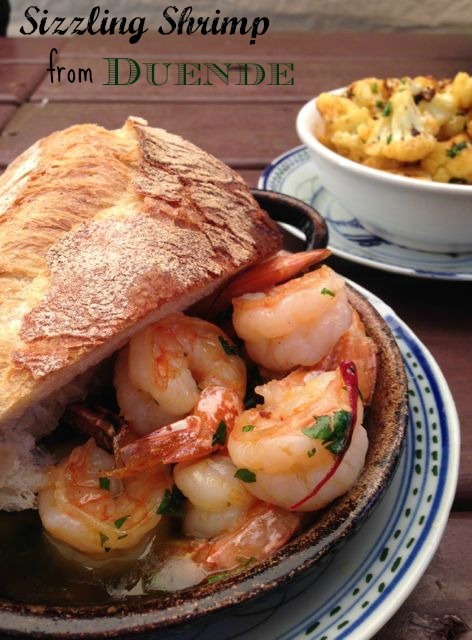 The large, flavorful sizzling shrimp were off the charts amazing. We literally stared at this dish and kept saying we couldn’t believe this came from a food cart. I can’t wait to get back and try more things. I’m not much of a waffle eater, so you need to know that these are very special waffles. Very special. 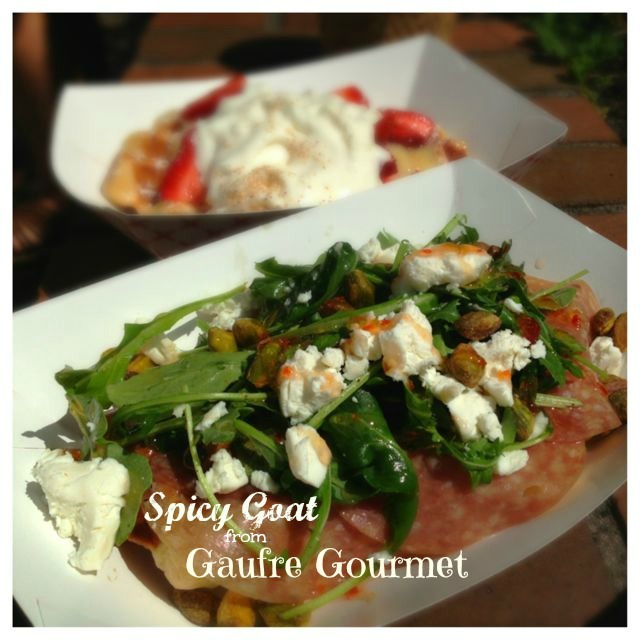 My favorite from them is the savory waffle called the Spicy Goat. Salami, goat cheese, Kelly’s Jelly, arugula and pistachios. I chose this as the winner, this last summer, at the Summer Food Cart Festival that I was judging at. I am standing by that decision. This cart is nestled in the downtown crowd. Take time to find this hidden gem. This cart is cranking out some of the best food in Portland. I have said it a few times and I will say it again. The depth of flavor in her dishes is crazy. The latest thing I tried was the most flavorful, yet lightly dressed mac n cheese. 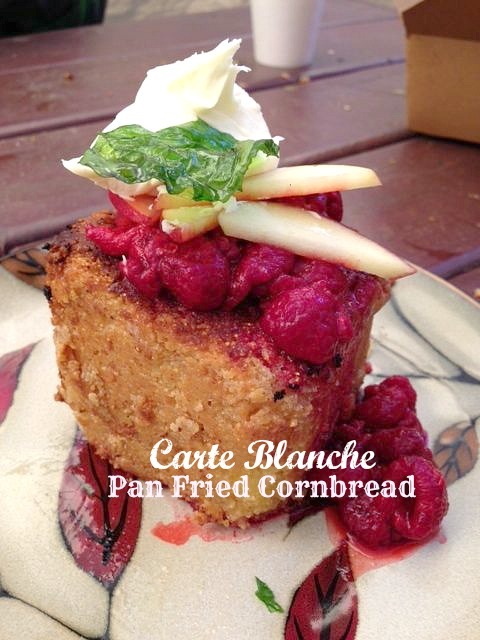 The pan fried cornbread dessert was pretty impressive too. Her menu is always changing. I have loved everything I have eaten here. This is one of the first food carts that I went to that didn’t have paper plates or boxes. Presentation really got my attention here. It doesn’t stop there. They put a lot of attention into the cheeses that they buy. 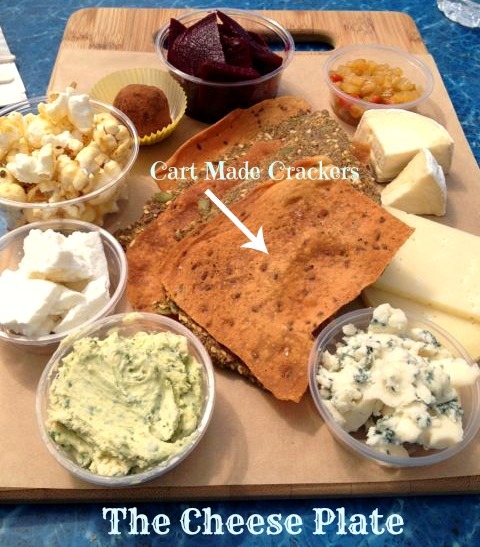 The Oregon Cheese lover’s plate is such an array of local cheese. I love supporting local. Just when you think they have wowed you all they can, they give you cart made crackers to put your cheese on. If that doesn’t put a smile on your face, then maybe the local goat cheese truffle will. A coffee cart in Portland is nothing new. What Todd is doing is new and it’s awesome. He uses a local coffee, Ristretto Roasters. He uses home made quality syrups and gives coffee away. Yep, you heard me right, he gives some away. It’s a pretty cool concept and you need to read all about it. The quality of coffee and coffee drinks that he is making is pretty awesome. The downtown crowd is lucky to have Ole Latte Coffee. Now do you understand why I have had such a hard time picking a favorite for the year? 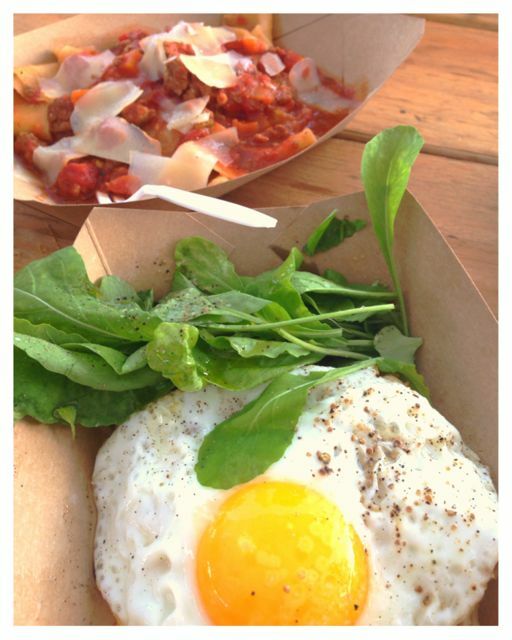 With over 600 food carts in Portland, I am only scratching the surface with this list. As a matter of fact, here is another contender we need to keep our eyes on. Burrasca. 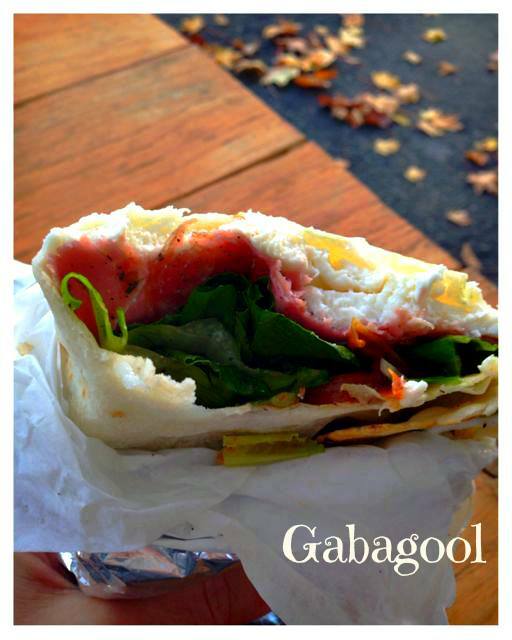 If you prefer a sandwich, then don’t miss 5 Sandwiches Worth Stopping For. 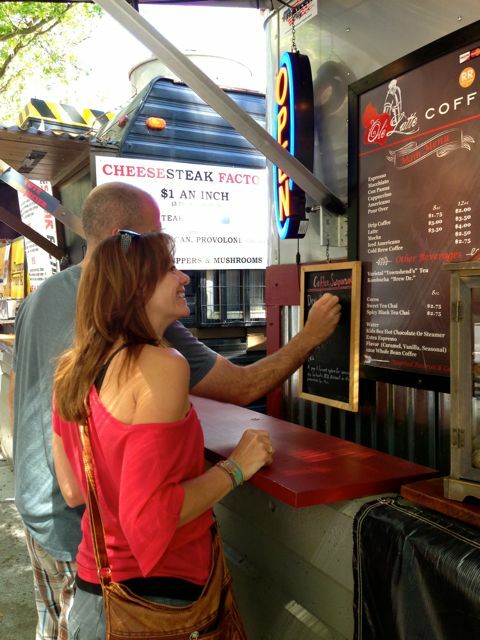 What food cart have you been to lately that was extra impressive? I have never been but the phone # for Nongs Khao Man Gai was incorrectly listed as my phone # and I used to get hundreds of calls a week about how good my chicken was. I have heard the chicken here is out of this world. Wolf & Bear, Egg Carton and PBJ’s Grill were my favourites during a recent Portland visit. I have not been to Wolf & Bear or PBj’s Grill, but Egg Carton is one of my favorites for sure. Carte Blanche is the only one I’ve been to on your list. I need to get crackin’!